Optimizing Anabolic Density With Protein Pulse Feeding! You probably don't need to be told that maximum anabolism is ideal for muscle growth, strength, and recovery, but how? Here's more about anabolism, whey is better, protein pulse feeding and more. Check it out! You probably don't need to be told that maximum anabolism is ideal for muscle growth, strength, and recovery, but how do we get there? In this article we'll look at nutritional supplementation that can increase anabolism by at least five-fold and how to apply it to your current diet. Everyone who has ever picked up a weight is looking to increase anabolism, even if they didn't know it. For our purposes, this process refers to the muscle growth and recovery we experience from lifting -the scientific term for which is protein synthesis. For those people who are training to lose fat or improve athletic performance, elevated protein synthesis is still what we're after, because this is what ultimately causes adaptations to our body. If we can maximize our protein synthesis, then it is reasonable that we will increase both the magnitude and rate of our results. In other words we'll get bigger and stronger faster than before. So how do we do it? Training: Okay we all train. This is nothing new, and if you're reading this article, then there's a good chance that you're probably already maximizing this one. Diet/Supplementation: The most often overlooked way to increase anabolism is directly through diet! In fact most people aren't even aware that we can induce muscle protein synthesis with our food. What's more, the effect is so powerful that it even works in the absence of training. In order to figure out how to maximize the dietary stimulation of growth and recovery we need to understand how it works. Quite simply, a sudden burst, or pulse, of amino acids in our bloodstream signals our muscle to grow and repair. This practice is so powerful that it's known as the pharmaceutical effect of amino acids! Anabolic density refers to the amount of protein synthesis in a given time period, usually 60-90 minutes. The more anabolic the protein in a short period of time, the greater its anabolic density. In order to maximize our results, we need to make use of high anabolic density meals, just like we do post-workout. For example, we can compare a fast protein like whey hydrolysate and a slow protein like casein. Both are excellent quality proteins and each has its specific function. But in virtually every study between these two proteins anabolic density is ignored and only the end result is reported. This is completely misleading because it ignores the benefits of whey! When we examine the amount of protein synthesis that is stimulated by each protein over an hour, whey protein is approximately 5X more anabolic! Only when we stretch out the timeline to several hours does casein eventually catch up to whey. 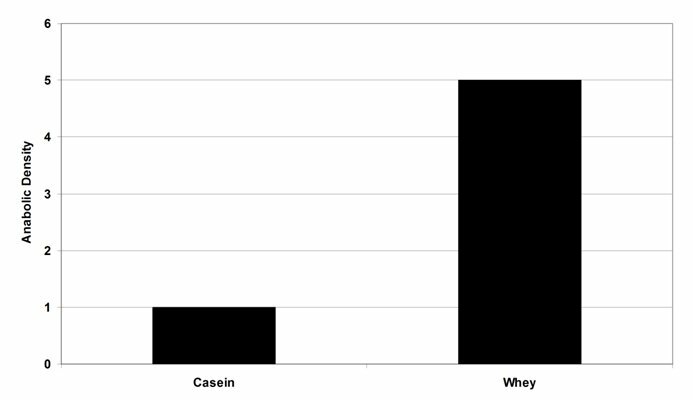 Comparing The Anabolic Density Of Casein And Whey Proteins. It's important to figure out what this means in terms of actual effects. After all, how much can these meals actually impact our results? Considering that protein pulsing is the most anabolic nutrition and supplementation we have, that helps a little. But even still we should quantify everything to put it into perspective. If we add two such drinks a day for a week, we're increasing our overall density by a combined total of 70. If we do this for a month, we're getting a whopping increase of 280! Compare this to post-workout nutrition alone, something that we know is highly useful for growth and recovery. Based on 4 training days/week, this practice would have a combined density of 80. So to put it into perspective, take that incredible effect and multiply it by 3.5! That's the kind of difference we're talking about, simply by using two pulse feedings a day. You don't have to be a mathematician to see the magnitude of effect when this is done for a year. So at the end of the day what does all of this mean for you? Ultimately it means more muscle, strength, and recovery. So how do we actually make use of this optimal anabolic density? We use a technique called Protein Pulse Feeding. Just like a post-workout drink, this protocol involves the use of fast proteins and their ability to rapidly pulse (i.e. spike) the level of amino acids in our bloodstream. This pulsing effect stimulates anabolism to such a large degree that it's called the pharmaceutical effect of protein. Key Point: The benefit of the post-workout meal comes from pulsing our protein, not so much the workout itself. Now imagine applying this powerful effect multiple times a day. The only caveat is that we can't have eaten a meal within a few hours of attempting a protein pulse feeding because this will not only slow digestion, it will leave us with a smaller magnitude of pulse. This means that in addition to post-workout, a great time for such a meal is immediately upon waking. When we first wake up, we're usually in a catabolic state as our various tissues are robbing our muscle of amino acids. Stated differently, our hard-earned muscle is being broken down to feed other types of cells. By consuming a meal of whey protein shortly after waking we quickly put a stop to this cycle of muscle breakdown. Not only that, but we turn this otherwise negative situation into one of muscle growth! In fact, that's the beauty of this whole process: the amino acids we deliver to our muscles not only stimulate the growth and recovery process, they're also the building blocks from which this new muscle is made! It's a beautiful one-two punch that greatly improves our anabolism. Joel came to me after reading The Anabolic Index and wanted a little help with his gains. He had been training successfully for nearly a year and was looking to add even more size and strength to his 5' 9" frame. His diet and training looked very good, so with a couple of tweaks here and there, we also added protein pulse feeding. Joel was already maximizing his anabolic density after training with a post-workout shake, but was excited when I explained that we could do this at other times during the day. He started off with a fast shake first thing in the morning followed by a solid protein-containing meal an hour later, and reported an immediate difference in the way he felt. After a week he decided to add a second protein pulse later in the afternoon. During the second week Joel reported that all of his lifts were up and his muscles were feeling fuller, particularly in his chest and shoulders. This is not unusual because he was increasing his daily anabolic density by 10-fold with the addition of this second feeding, and that's not even counting the benefit from the post-workout shake! So far it's been a month of protein pulse feeding and Joel has improved in all of his lifts and added muscle. The only side effect has been fat loss, which, not surprisingly, is something that he's happy with. At the same time, this effect bears mentioning: the act of stimulating muscle growth with protein pulse feeding is going to burn a lot of calories. Not only that, but muscle is our most metabolically active tissue, so the more of it we have the more calories we expend. Muscle Is Our Most Metabolically Active Tissue. So as Joel was building and maintaining more muscle, his calorie intake increased. He didn't adequately make up for this in his diet, so his body relied on bodyfat for the energy; hence the fat loss. The powerful anabolic effect of a post-workout drink is actually initiated by the protein itself, and the best part is that we can make use of this throughout the day. More specifically, we can take advantage of the high anabolic density of whey in order to maximize our growth and recovery. 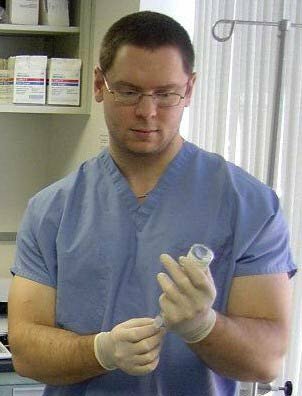 Most people report that they look and feel better shortly after beginning a protocol of protein pulse feeding, especially when this is done first thing in the morning. Give it a try and see how quickly you notice a difference! Biolo G, Maggi SP, Williams BD, Tipton KD, Wolfe RR. Increased rates of muscle protein turnover and amino acid transport after resistance exercise in humans. Am J Physiol. 1995 Mar;268(3 Pt 1):E514-20. Boirie Y, Dangin M, Gachon P, Vasson MP, Maubois JL, Beaufr?re B. Slow and fast dietary proteins differently modulate postprandial protein accretion. Proc Natl Acad Sci U S A. 1997 Dec 23;94(26):14930-5. As a strength coach and scientist, David brings a unique perspective to the areas of diet, supplementation, and training.